Wargame: AirLand Battle was about as beautiful looking as its title was stupid sounding. From the evidence of this first trailer for the tactical RTS series' upcoming sequel, the slight reduction in nonsensical nomenclature hasn't brought about any drop in graphicsability. Or deadliness, for that matter. While the dragon of the title refers to the Asian setting, and not a new fondness for fantasy lizards, there's still plenty of fire-power on show. 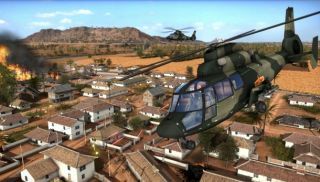 "More ambitious than Wargame AirLand Battle, Wargame Red Dragon essentially retains the same game mechanics that made the series so successful," claims the press release sent out by publisher Focus Interactive, "but the action leaves Europe for the first time and shifts to a conflict in central Asia between 1975 and 1991, and adding loads of new features. 5 new nations, among which China and North Korea, join the armed forces in Wargame with over 450 new units." Some of those new units will be naval and amphibian, which is a first for the strategy series. Red Dragon will offer players a full campaign mode, involving a tussle with North Korea, and a return of AirLand Battle's 20-person multiplayer. Wargame: Red Dragon is due out later this year.